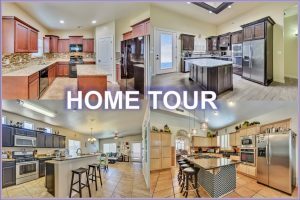 Home For Sale Tour by The Purple House Real Estate Group Under Brokerage of ERA Sellers & Buyers Real Estate. Two-story home with two bedrooms downstairs and three bedrooms upstairs along with a big loft. The master bedroom has a big master bathroom with separate shower and garden tub. This home offers a lot of space downstairs and upstairs. Home is only three years old and looks better than new because it is landscaped front and back. The home is move-in ready. Two-story home sitting on a cul-de-sac street with low traffic. This home has an office, dining area, wet bar, huge family room, kitchen with island, break fast area, master bedroom downstairs with big master bathroom, a mini master bedroom with its own bathroom downstairs, and three good size rooms upstairs and all with walk-in closets. The home needs to be updated, but the house is functional, and the updating can be done once you are living on it. The back yard is big and private. Two-story home on gated community located on Estancias Coronado subdivision. This community is known for having wonderful city views and Franklin Mountain views. The homes in Estancias Coronado are Luxury homes with plenty of charm. This home at Camino Barranca is beautiful and has plenty of space inside and out. It has 4 bedrooms, one office, formal living rooms, formal dining room, den, gourmet kitchen with plenty of cabinets and top of the line appliances, breakfast area, 2 spare rooms share a Jack-and-Jill full bathroom, the third spare room has its own full bathroom, big yard with amazing views and swimming pool/spa area. You would need to visit in person to see the real beauty of this home. Single-story home with 2 bedrooms and 1 bathroom. Open floor plan, as you enter you have the living room and dining room, and the kitchen is on the back but can be seen from the entrance. Both bedrooms are on the right side and share a Jack and Jill bathroom. The house does need a lot of TLC and one of the main things our buyers didn’t like, was that to access the bathroom, you would have to go through one of the bedrooms and that the kitchen was very small. This single-story home is in a good location near by Geronimo Drive and Interstate I-10. The home is situated on a big 13,599 square feet lot, but even though the lot is big, the lot has a weird shape and the backyard is kind of small. The home needs a lot of repairs and the green carpets definitely need to be replaced. The house does not include a stove or refrigerator and the kitchen is on the small side. For the price it’s not a bad purchase if you have the money to fix it up or if you are a handy person that can tackle a renovation project. The master bedroom is big and has a big walk-in closet, the two spare bedrooms are a good size as well and there is an additional small room that can be used for storage. The formal living room is at the entrance and opens to the breakfast area and the kitchen. There is a big addition towards the back of the house that can be used as a family/tv room. This single-story home has been renovated with new paint inside and out, new carpet and new tile. The water heater look new as well and all the interior doors were either replaced or repainted and according to the listing agent, the roof was recently installed. The home is well distributed, and all the bedrooms are on the left side of the home. As you walk in is the formal living room, then the breakfast area and the kitchen and then the huge family room. The master bedroom is big and has two closets and a full master bedroom. The yard is big and have space in the front and back of the house and is great that there are no back neighbors. This home is located on the Northeast near by Hercules Ave. and Diana Dr.
Duplex in excellent condition located on the Northeast by Hondo Pass Dr. and Patriot Freeway US-54. This 2-unit duplex is a great investment opportunity for anyone looking to add income producing properties to their portfolio. Both units have 3 bedrooms and 2 bathrooms, spacious kitchen, dining area and living area. Tile floor throughout and interior was recently painted. This duplex are ready to move in without spending any money on repairs. Single story home on a 6,050 square feet lot. It is a small home that needs some repairs, but in general it is a good home for the price. It has a good size living room and dining room, the kitchen needs some updating but it is functional, all three bedrooms are good size rooms as well. Tile throughout the house and the utility room is next to the kitchen on a separate room. The back yard is big and there is a long driveway on the front of the house that can fit three maybe four cars. Easy access to Interstate I-10 but one con is that this is a busy street unless you don’t mind the car noise, then it is in a great location centrally located and everything is near by. Gorgeous two-story home with plenty of space inside and out. As you walk in you are greeted by an inviting foyer with a beautiful ceiling design. As you pass the privacy wall you’ll find the living room that overlooks the swimming pool and the golf course with mountain views. Next to the living room is the big dining area that opens to the kitchen. There is a maid’s room next to the utility room and there is a big office with a bar at the end of the hall as well. The master bedroom is big and has a huge master bathroom. On the bottom floor there is a huge entertainment area with a bar and access to the swimming pool. This home is beautiful, and the views of the Franklin Mountains are spectacular. Great Tri-level home in great condition one block away from the Chuck Heinrick Park. On the main floor is a flex room that can be used as a formal living room or as a bedroom if needed, there is the dining area, the kitchen and the breakfast area are on this same level. Downstairs is the family room, utility room and the guest bathroom. From the family room you can go to the backyard and enjoy the swimming pool. Upstairs you have all the bedrooms to include the master bedroom that has a balcony. The house is move in ready and it shows pride of ownership.